We’re pleased to let you know that there is another EP just weeks away - ‘Showcase In Dub’. Four extra classic, extra special dub cuts from our very own Ben Mckone! Pre-order your CD copy now and receive the digital WAV download FREE! The EP will also be downloadable through all your usual streaming outlets (Spotify, Apple, Amazon etc). Get dubby! On Friday 16th November 2018, we lost a brother, a father, a mentor and a General. Samuel Stevenson Matthew. ‘Brother X’; The Minister Of Happiness. Experiencing loss is unique. There is no preset rule for how to deal with grief. A common feature for all though is the perspective it brings. The Minister had a lust for life and wanted to spread only love, joy and happiness around the world. This is not only the vision of our music, but our vision as human beings. To the bystander, he was an exuberant character you would see lunging across festival stages, rain or shine. “We’re here to turn them frowns upside down!” His arsenal of positivity was unlimited; his vibes were endless and his energy infectious. He loved nothing more than making people smile and dance. Nobody was a stranger to The Minister. We spent nearly nine years travelling all over together. Whether it was sleeping on a sofa bed or in the Hilton, on a Megabus or on an airplane - he was in it for the long run. His mission was simple: maximum vibes for everyone. “Laziness is an enemy to yourself.” He would often put us younger ones to shame, dancing, singing and laughing deep into the early hours. It was easy to forget he was no spring chicken a lot of the time. Another highly beautiful aspect of his being was that he was the same person offstage as he was on it. He cared only about sharing good vibrations with anyone and everyone. He loved music, sport, history and current affairs. An incredibly knowledgable man with a heart of gold that he wore proudly on his sleeve. Not only was The Minister a people person, he was a family man; a father, a husband, loved dearly by those closest to him. We feel honoured to have known him, to have made music together, and to have shared some unforgettable adventures, which we will cherish forever. His voice will remain eternal within our music, and his inspirational energy will stay with us wherever we go. We Are General Roots. ‘SHOWCASE’ - THE BRAND NEW EP OUT NOW! + LAUNCH PARTY! It’s been a while coming but we’re over the moon that you can now all finally hear the brand new record in full! We’ve worked hard to get this to you as soon as possible, but as they say; good things come to those who wait, and we hope that you feel that when you listen to it! In celebration of the release, we’re throwing a launch party to welcome it into the universe, and end the year on a high, and we’ve got some extra special guests to join to help us raise the vibes meter into the red! Singer songwriter and good friend Jesse Wong AKA Rude Health will be playing live (serious vibe) and to ice the cake we’ve also got UK reggae behemoths and festival favourites Gentleman’s Dub Club on the decks! CHECK OUT THE NEW EP AND LET US KNOW WHAT YOU THINK! GRAB A TICKET AND COME SEE OUT THE YEAR WITH US IN STYLE! PRE-ORDER YOUR COPY OF ‘SHOWCASE’ ON CD NOW! Not long now until we unleash the new record out into the world! Head over to the GR shop and pre-order a CD copy of the new EP, released November 8th! Nothing like a physical copy of something, and it helps us keep doing what we love the most…making tunes for you lot! You know what to do, click the link! ‘SHOWCASE’ - THE BRAND NEW EP OUT NOVEMBER 8TH! We can finally share with you the news you’ve all been wanting to receive for a while now, NEW TUNES! Our four track EP entitled ‘Showcase’ will be available digitally to download and stream across multiple platforms, as well as physically on CD. We’ve even got our good friend KIKO BUN to guest feature on one track, you don’t want to snooze on this one! 2018 TOUR WITH HOLLIE COOK! We're delighted to announce we'll be joining our wonderfully talented sister HOLLIE COOK on her 2018 UK & EU Tour, starting in February 2018! At the end of January; Hollie will release her third studio album 'Vessel Of Love' on US label Merge Records, and we're over the moon to be able to hit the road with her in celebration. The General Roots Band will also be backing Hollie during her set, so it's double the vibes! Expect some brand new GR riddims for the support set too! The tour begins on February 6th in Nottingham, UK and continues through the UK, France, Netherlands & more! Tickets are on sale now! JULY UPDATE - DANK JE NETHERLANDS! THANK YOU UK! The answer being... THE STUDIO! We've not been racking up too many miles on the road the first part of 2017, but we have been busy recording a brand new EP in the studio, produced again by our very own drummer/producer maestro Ben Mckone. We have 5 brand new tunes sounding scorching already that we plan on dropping towards the end of the year, so stay tuned for more info! In the mean time, we do have some cool summer shows coming up, including our very first show in The Netherlands at Zwarte Cross Festival, and a short UK support tour with Californian reggae rockers Sublime With Rome! Check the 'Tour' tab for full summer dates! Come see us at one of Three O2 academies this August! Tickets on sale now! THANK YOU UNITED KINGDOM! SPECIALS/GR TOUR ENDS IN STYLE! UK AUTUMN TOUR WITH THE SPECIALS STARTS IN STYLE! We've been on the road for 11 days now supporting 2tone legends The Specials and we're already feeling the love! Thank you to everyone who has come down and caught a vibe at one of the shows, they just keep getting better and better! 'Walk Tall' is now available on vinyl exclusively at these live shows until the end of November with online purchase links to come soon! Still to come...Llandudno, York, Leicester, Wolverhampton, Exeter, Southampton, Reading, Norwich, Cambridge, Southend, Eastbourne & finishing with two SOLD OUT nights at London's Troxy! THE SPECIALS & GENERAL ROOTS HIT THE ROAD...! We've a giant honour of supporting 2Tone legends The Specials on their 21 date UK tour, starting this October! We'll be hitting up a whole bunch of towns and cities we've never played in before, so make sure you grab a ticket whilst they last, they are flying out like hotcakes! This October we are proudly presenting our own night of roots reggae music right on our doorstep! Working alongside Eleven27 Productions, we have been given the chance to curate our own event bringing in some highly talented friends & family to support! 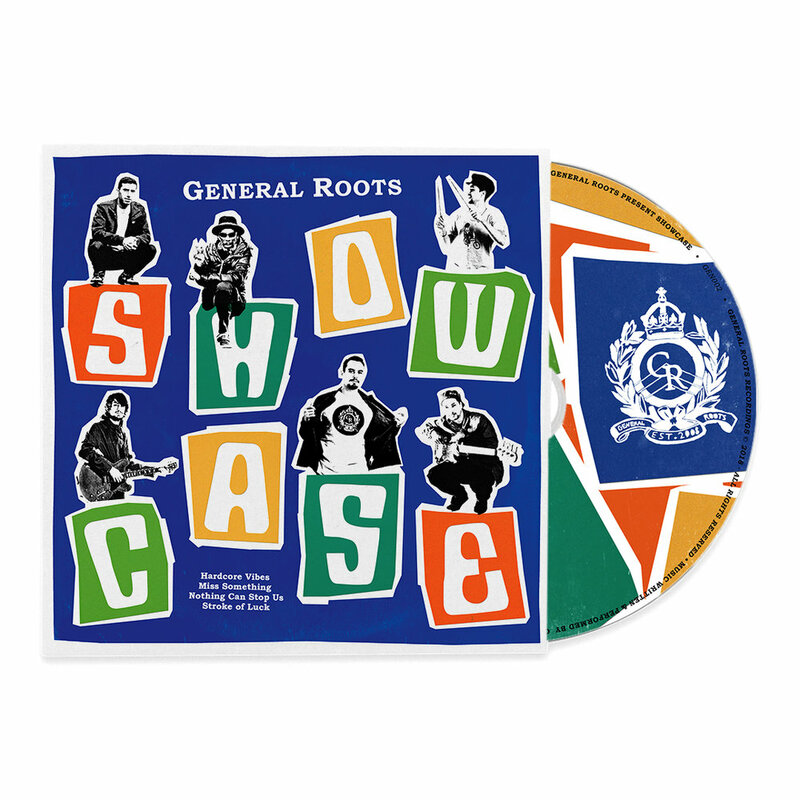 Hornsey Town Hall in Crouch End welcomes General Roots (Live), Hollie Cook (DJ), Jamie Rodigan (DJ) & Royal Sounds (Live) through its doors for a night of real reggae music! Tickets are flying out now so grab yours while they last! Back in April we were invited to a secret warehouse in North London to perform some tracks acosutically off the new album! New territory for us, but exciting none the less. Check out the video from our Sofar Sounds session! Let us know what you think! 'LITTLE SUN' - OFFICIAL VIDEO NOW LIVE! Our latest video features the band stripped back to the roots! Musicians, instruments, doing what we do best. Filmed & Edited by the talented Alex Cantouris (who also did our video for 'Special') CHECK IT! 'WALK TALL' - THE DEBUT ALBUM OUT NOW! It's safe to say we are over the moon to be able to present to you our debut album 'Walk Tall' - Released on 3rd June 2016! The Ten-track album features some extra special guest features from UK reggae greats such as Dennis Bovell, Top Cat & Horseman respectively. Within the first week of release, 'Walk Tall' was championed on BBC Radio One & BBC 1Xtra by the likes of Toddla T & David 'Ram Jam' Rodigan, and also rose to No.6 in the iTunes reggae chart! The album is released through Evergreen Recordings, and is available through digital download & physical CD format (visit the SHOP at top of the page!) or choose from one of the links below. Enjoy! NEW ALBUM IS NEARLY UPON US! We're delighted to announce that our debut album entitled 'Walk Tall' will be released through Evergreen Recordings on 3rd June 2016! It will available for digital download across many platforms, and also on CD with some excellent hand painted artwork by the multi talented Divya Scialo. We've produced ten tracks for your pleasure, with guest features from some of the UK's finest reggae artists such as Dennis Bovell, Top Cat & Horseman. For a FREE taster of the album, just follow the link below and sign up to the GR Soundcloud for your free track! March 26th will see us play live on a moving river boat for the first time as part of The London International Ska Festival 2016! We'll be joining East London ska punk rockers The Skints for a special day cruise as main support on the very special 'Dixie Queen' paddle boat along the Thames River in London. Only 500 tickets allocated and VERY VERY CLOSE to selling out. Don Letts will be on deck, on the decks too.....Act quickly! See you on the river! GENERAL ROOTS WARM UP FOR THE GENTS! The debut album is days away from being fully mixed so plenty of new riddims coming this side of summer! In other news, we are starting to lock in live dates for the year, and one we can't wait for is a london special. Festival favourites Gentleman's Dub Club will be headlining KOKO as part of their UK Tour and we have the pleasure of supporting on the night. Thursday 10th March is the date! GENERAL ROOTS LIVE & DIRECT IN CAMDEN, LONDON, UK! 'Sufferer'- The Single! First release of 2014 from General Roots- Produced by Dennis Bovell. Recorded in Brighton, UK Dubbed by Ben McKone at Boogie Back, North London.